Students will be watching how ants' foraging behavior changes in microgravity. Just call them "ant-ronauts." A private robotic spacecraft that launched to the International Space Station Thursday (Jan. 9) may have been unmanned, but it was packed with about 800 living six-legged spaceflyers hoping to set up a colony in orbit. As part of a student experiment, eight ant farms hitched a ride to the orbiting lab alongside the food, supplies and other gear being delivered to the astronauts. The space ants launched into orbit aboard an Orbital Sciences Cygnus spacecraft that will arrive at the space station early Sunday (Jan. 12) at 6:02 a.m. EST (1102 GMT). You can watch a video describing the ant farm in space. "There will be cameras watching the ants and that imagery and video will be beamed down to students on the ground," Ruttley explained. "And the students will have their own educational experiments set up in different classrooms around the country." The experiment will study how weightlessness affects the way groups of ants move when they're collectively looking for food. Previous research has shown that individual ants in crowded groups will each scout out a small area by walking in a "random" circle, said Stefanie Countryman, of BioServe, a University of Colorado Boulder research center that devised the experiment. This image shows the common pavement ant, or Tetramorium caespitum. 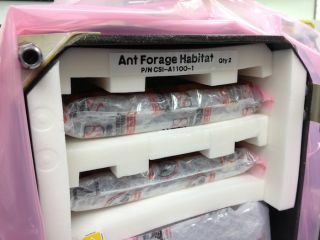 A colony of these ants launched to the International Space Station for the Ants In Space experiment on Jan. 9, 2014 to study swarm behavior in weightlessness. When searching for the perfect ant for space travel, the science team opted to fly Tetramorium caespitum, or the common pavement ant. Some of the ants were collected from Boulder, Colo., while others were harvested from North Carolina and the launch site at NASA's Wallops Flight Facility on Wallops Island, Va.
Students will study how groups of ants search for food microgravity. "When ant densities are low, each ant searches by walking in a relatively straight line, allowing it to cover more ground," Countryman, who is BioServe's business development manager and education program director, explained in a statement. The experiment will analyze whether ants in weightlessness swarm like they do on Earth, with ground controls in the form of ant farms in K-12 classrooms around the world. According to NASA, analyzing how ants intelligently swarm could lead to better mathematical solutions to route trucks and schedule airline flights, among other complex real-world problems. Ruttley also said that lessons about animal adaptation to different gravity conditions apply to every living organism that flies in microgravity. "We're all creatures of the gravity environment," Ruttley said. "We, humans, astronauts, we go up there, we adapt, we come home we have to re-adapt again to Earth." She recalled that spaceflying jumping spiders initially kept doing back-flops after they came back to Earth. Eventually, the creatures readjusted to life with gravity. The ants were just a small part of the payload aboard the robotic Cygnus spacecraft, which launched Thursday in the first official space station mission for the private company Orbital Sciences Corp. under a contract with NASA. The other experiments on board included a CU Boulder experiment to test the effectiveness of antibiotics in space, 22 other student experiments and 33 small cubesat satellites.